I prefer hiking, but the dog likes dog parks, too. 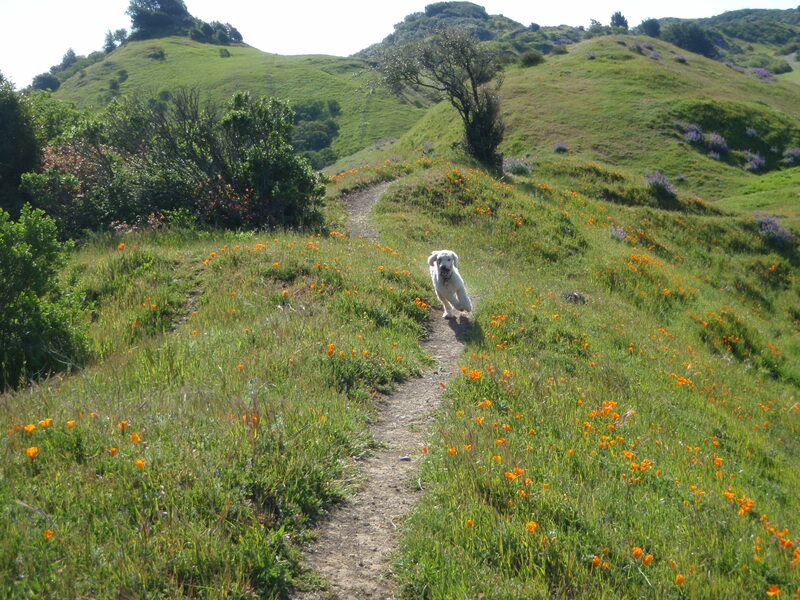 I have no pretty pictures of the Alameda Dog park, but here is a picture of the wonder poodle with the wildflowers . I went to the dog park today. I prefer going hiking with Sacha, the wonder poodle, because I find it less boring than the dog park. However, the dog likes the dog park. Today’s trip reminded me of this note I put on Facebook. From August 26, 2009. I am starting to prefer discussions about other people’s children. A discussion of some kid’s book report is not actually a conversation I have daily and tomorrow that mom will be discussing something else about her kid. I won’t have to relive the same daily book report conversation for 10 years. Alameda Park is full of CDP, while Piedmont Park is oddly not. I am not sure the reason for this distinction between these groups. Piedmont discussions concern business travel, teacher/child relationships (how’s Caitlin getting along with Mr. Garrigan?) softball (did you sign Jonathon up for the child pitch league yet? ), prom dresses (I may have hit my limit on conversations about prom dresses), dating, and alcohol and drug consumption. I like the Piedmont group as parents. They seem a little critical of their children, which, as a bystander, is far more amusing than the usual baby worship. As I stand around watching my dog smell a tree, I have a much better chance being amused by a funny story if standing next to some dad complaining about his 17 year old boy. However, I have lost all patience with discussions about a child’s supposedly remarkable brilliance. In all cases, I have found that discussions about a dog’s intelligence to be far more interesting and actually more impressive than discussions about some kid’s superior intelligence. Kids are nowhere near as impressive as parents seem to think they are, whereas stories about dogs can (on admittedly rare occasions) be quite amusing and impressive. My favorite smart dog was one who could open a deadbolt. This dog’s intelligence was further enhance by the fact his owner was a moron. In general, I sit alone on urine-drenched plastic lawn chairs and plan my escape. My dog has bad recall and doesn’t come when he doesn’t want to come. I used to carry around cut-up pieces of handmade, organic, locally farmed, locally produced and (obviously) expensive salami in a small ziplock bag in order to bribe my dog to leave the park with me. In a stunning flash of brilliance on day, I realized that I was actually insane and replaced the salami with chicken hot dogs, which work just as well. My dog still only leaves when he wants to leave. I need to figure out how to work my ipod.